Oh, I got the bug yesterday! Between an early Hanukkah, timed with Thanksgiving and then straight into Christmas....I haven't scrapped just for me in quite a while. Yesterday, after I completed an assignment, I decided to continue to play. And it felt really good! Last moth was so busy, I didn't get to participate in any of my favorite challenges. Well, today I am BACK! Scrap Our Stash is one of met favorite places to play. The first challenge this month is to use a phrase from a subway art poster to do a page about family, and then use...photo corners! And wince I'm out of my scrappy groove, I needed a design push. Let's Get Sketchy Week 2 sketch is what I used to get me started. While looking for a different old photo, I came across these of me with my grandparents when I was about 2 years old. I've been having a lot of fun scrapping pages of my childhood. It's good to get the photos and stories down. But it's even more fun to play with different colors and supplies than I usually do when I about my boys. Photos of family? Check. Great sketch adapted to my photos? Check. Perfect title? Check. Fun papers and pretty embellishments? Yes please! I've not been one to over embellish my pages. I like the supplies to complement my photos and not overwhelm them. However, I've recently come to really like using the "little bits" on my pages. Fortunately for me, there were lots of little bits and other fantastic embellishments in the Citrus Twist Kits I received this fall. As for the photo corners, they are not actually something I normally have on hand. I received these as part of a class kit from CKC. Using a collection kit made all of this come together rather quickly. Having a variety of pretty little bits made the details come together nicely as well. The only thing I did not do, was add journaling. I think I will write something on the back of the page. I'm not sure what perspective I want to take. Thanks for looking at things form my creative view. If you get a chance this month, head over to two of my favorite challenges, Scrap Our Stash and Let's Get Sketchy and join in. Cute! And check out the pink! Love the vintage photos---aren't you just adorable!?!?!!!! Love your use of the pink--it really complements your photos. You were just adorable at 2! Love the colors and textures! The pictures are adorable, too! Love your take on the sketch! Thanks for joining us @ LGS. An adorable pink layout! 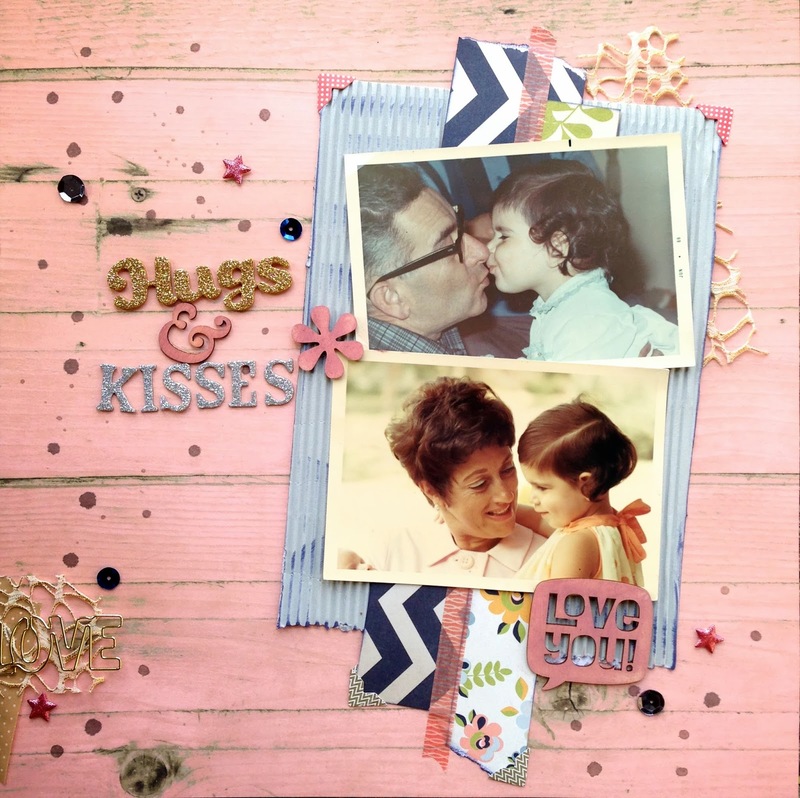 Love the layering, the mix of blue & pink, the ink splatters, and the little bits....really made for a neat layout! Sweet title, too! That pink woodgrain is one of my favorite pages of all time, it looks lovely! Great pictures and use of the sketch. Thanks for sharing at LGS, I hope you can come back the rest of the month!! LOVE that Pink! I also like your embellies & such cute pics! Beautiful page Devra! Those photos are so precious! Thanks for joining us at LGS! This is so precious! I love those photos and I love your pretty product choices! You rocked the sketch challenge at Let's Get Sketchy, and also the Scrap Our Stash challenge. Beautiful job Devra! Thanks for joining LGS & SOS. So glad you found some scrappy time! Love what you did with the sketch!! !Precious photos :) Thanks so much for joining us this week at Let's Get Sketchy! I adore this!! Love the colors and all the texture...and I love the way you split up the corners! Thanks for playing with Scrap Our Stash! Happy Holidays! Your layout is just fabulous! I love how you worked with the sketch! Thanks so much for joining us at LGS! Beautiful layout and fantastic take on the stash challenge! Thank you so much for linking up at Scrap Our Stash! Love all your layers and paint spatters on this sweet layout! Thanks for playing along with us at LGS! Beautiful take on this weeks sketch! love the background paper!Thanks for playing along with us at Lets Get Sketchy! such a sweet page and love love your colors!!!! thanks sooo much for playing along with LGS this week!!!! Fantastic page - love the pink background. Thanks for playing at Let's Get Sketchy! Fantastic page: love the colors and the picture are so precious! Thanks for playing along with Scrap Our Stash! Sweet photos! love all the little details on your page! Thank you for playing with us at Scrap our Stash!